Petal Farm (originally Petally) was a game developed by Superpea LTD between 2012-2016. That's right, it took 4 whole years to perfect which is a lot of work for a phone game! So why does it rock?? Petal Farm is a free to play flower farming game from a 3rd person perspective bringing unprecedented immersive quality to the traditionally top-down 2d genre. While fun to jump in and out of, Petal Farm has hundreds of hours of content to unlock and there is no limit to how much you can expand your farm. The game is full of suspense as true luck determines when your next super-rare flower spawns which, along with your ability to find it, is crucial to the research and farming of better quality seeds. You are continually challenged by your ultimate nemesis; yourself, as you try to beat your own Profit Record score, making you better and better at running your farm at maximum efficiency. Strategy and careful planning will make or break a new farmer as a finite supply of tools (sprinklers, scarecrows, speed buffs and daisy cannons) are all you have to grow and protect your fields from the relentless attacks that Birds, Locust swarms, Droughts and even Tornado storms throw at you. The game is fully online which allows you to log in from your phone to make sure your Bees are collecting honey in the morning then beat your friend's Profit Record from your tablet when you get home. Full 3rd person control is not a simple thing to deliver to a touch-screen so pay attention to the opening segment while you get used to moving the character. Touching the terrain will move the girl there and you can hold touch to continually update the girl's direction. Touching close to the girl's feet will cause her to walk slowly and touching close to the bottom left or right corners is the best way to turn sharply. There are 9 Objectives which set out to teach you how to run your farm, and each must be completed in order. If you ever forget what your current Objective is just press the menu button in the bottom left corner for a reminder. The first objective requires you to collect wild flowers from the nearby fields and assemble them into Bouquets at the Workshop. 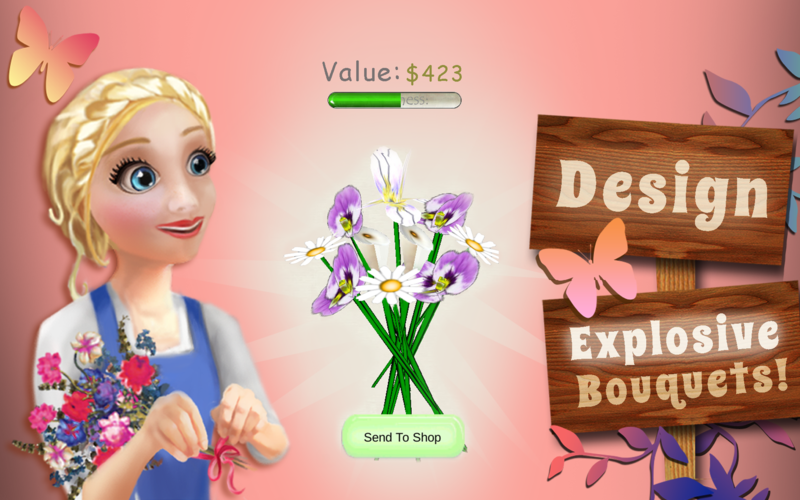 Selling Bouquets at your Shop is the primary mechanism for making money in Petal Farm. Why sell 5 bouquets when you can sell 500? This objective teaches you the basics of planting seeds and filling the fields with your choice of flowers. Don't forget to keep selling bouquets to earn money for more seeds! Flowers need water to grow, and collecting water from the river all of the time is hard work, in this Objective you'll save up for your first tool.. The Sprinkler. So you've planted a few Candytufts and Tulips and are starting to make decent money, but you want MORE! In this Objective you'll need to keep an eye out for your first Rare flower, Forget m'Nots, which occasionally spawn in the fields. Once you've inserted 10 of them into the Seed Researcher you'll unlock the ability to plant the much more valuable Forget m'Not Seeds. Your farm is growing and you're starting to find it difficult to collect so many flowers with just one pair of hands. Clever Cats to the rescue! In this Objective you'll recruit your first Cat and send him on a flower picking mission where he will need to collect 1000 flowers. Don't forget to empty the Cat Pile as when Night Time comes any flowers left in there will Wilt. Here you'll need to max-out your terrain, filling each zone with 50 seeds. While you can plant whatever you want wherever you want it pays to be patient and invest in the most valuable seeds as they will give you a much higher return at the Flower Shop. If you can bunch your flower types together in adjacent Zones you'll get a Group-Bonus which will cause even more Extra Flowers to grow! You've packed every square inch of your terrain with flowers, leaving only one way to expand.. Buying more land! Here you'll save up the $2000 required to buy the Cockerel's Closure from Ms. Wiggins, opening up 8 new Zones for planting. Now that the terrain is yours you can get to those Purple Irises that have been staring at you from the other side of the fence. Bonus! Flowers can grow with a bit of sunlight and water, but they can grow BETTER with Fertilizer! In this Objective you'll need to discard your less valuable flowers at the Compost and buy a few Worms which will get to work for you turning your unwanted flowers into Fertilizer for your terrain. The more Worms you buy the easier this becomes. You can get more money from your flowers if you bunch them into Prettier Bouquets. Here you learn about Bouquet Designing and which flowers pair better with each other and after which you'll want to reflect that knowledge in what you decide to grow. You'll also learn about Fixing Prices at the Shop to squeeze every last penny out of your customers before your bouquets Wilt. The Mailbox is your contact point with the outside world. Characters like Uncle Frank, Fancy Nancy and Lover Boy frequently get in touch with orders for certain types of bouquets. You never know what they are going to ask for so make sure you have at least some of every type of seed planted so that when an order comes you can satisfy them as they are worth a lot of money. You've only got 2 minutes to complete Mail Orders so you'll need to be quick and remember where you planted those seeds. If you find a high quality Rare Flower, the Crazy Scientist will drop you a mail and offer some money for it. You can haggle with him to double his offer but each time you do, there's a risk that he will get fed up and offer you even less. He is crazy after all. It's up to you whether to give in to the scientist's temptation for a quick buck, or whether to save your Rare Flower for the seed researcher so you can ultimately learn how to plant the seeds. You can write letters to your friends in the Mail Box and even use it to exchange presents which contain a surprise reward. Once per day the Present Guy will drop you a mail and offer you a present just for logging on! Petal Farm is currently being rolled out globally on Android so unless you are lucky enough to live in one of the following countries you'll have to sit tight and wait a few more days or weeks for it to arrive in your country. When it does, we'll post it here! We are also working to bring Petal Farm to iOS and expect to have done so within the coming weeks. Petal Farm is fully translated into English, Spanish, and Italian and we will soon be providing language support for Korean, Japanese and Mandarin. If you love Petal Farm as much as we do then making in-app-purchases and liking our Facebook Page are not the only ways you can support us! We are a small, hard working company and are competing with big players like Nintendo, EA and Sony for space on the Play Store charts. Every time we receive a 5 star rating, it literally pushes Petal Farm a little higher in the charts and we have a long way to go before we can expect the sort of visibility a product of this quality deserves. We massively appreciate your help in bringing Petal Farm to the world and we celebrate every time we recieve a new rating!